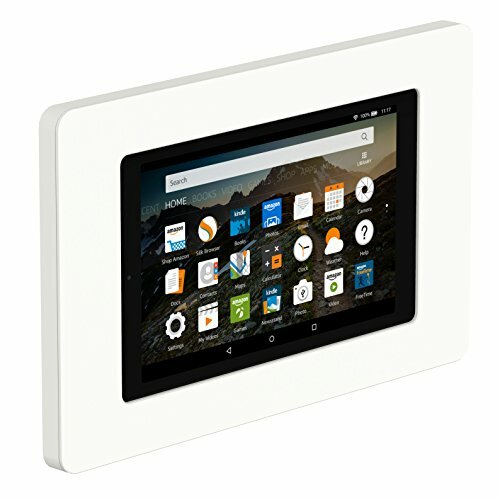 Our On-wall Tablet enclosure is the perfect synthesis of form & function! At about 1/2" [12mm] thick with zero wall clearance (no gap) means its low profile design will look great in almost any environment. Its removable snap-in cover provides easy access to the enclosed tablet yet remains firmly in place thanks to it's snap fasteners. Every piece is precision honed from a solid piece of high strength polymer - not molded or formed - for uncompromising strength and outstanding aesthetics. See our VidaPower solution for providing power to the tablet. We design, engineer and manufacture the VidaMount On-Wall Tablet Enclosure right here in Long Island, New York. We know your kiosk project incorporates hundreds or even thousands of dollars in time, software and hardware...so we thought it best to build the best protection for your display...right here. Tablet enclosure mounts flush to the wall. Simple installation on any wall surface. Tablet is accessible via snap-in removable cover. Easy access to tablet power button with cover removed. Fully compatible with VidaPower charging solutions.